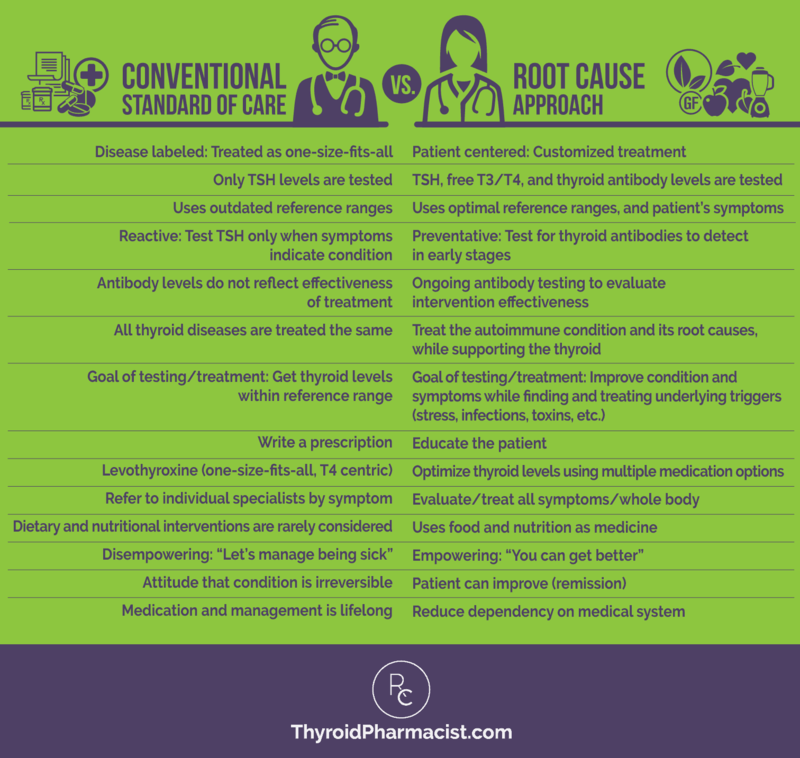 When I was diagnosed with Hashimoto’s in 2009, I was told I had low levels of thyroid hormones (because my TSH was elevated), and that I needed to take thyroid hormone meds to replenish my thyroid hormones. At the time, I wanted to understand why my levels were low in the first place. To me, I felt like the prescription-only approach was pouring my needed hormones into a “leaky bucket.” Wouldn’t it be better to figure out why the bucket was leaking and correct that? If you have Hashimoto’s, there is an autoimmune component causing your thyroid to be actively destroyed by the immune system. So while your thyroid function will likely benefit from some type of thyroid hormone replacement medication, that medication won’t address the “root causes” of your autoimmune disease, nor the reason why your immune system is attacking your thyroid. Everyone’s root causes of Hashimoto’s will be different, as we all have our own unique genetics, medical histories, and lifestyles. After years of trial and error, I eventually identified my own root causes… one by one… and corrected them. As a result, I’ve been able to put Hashimoto’s and my symptoms into remission — and I want the same for you! So today, I want to talk to you about the importance of tackling chronic health problems, such as Hashimoto’s, using a Root Cause approach — instead of today’s more commonly used, conventional “standard of care” approach. The typical doctor visit today is not the doctor visit of decades ago. Back then, most visits to the doctor were about acute issues. Acute issues are sudden and short-lasting (ear infection, viruses, a broken leg, accidents and the like), versus the lingering and worsening path of a chronic condition. Acute issues can be addressed pretty much the same way each time, regardless of the patient. Broken leg? You set it. Ear infection? Prescribe an antibiotic. You get the idea. In contrast, chronic conditions encompass long-term diseases such as obesity, diabetes, heart disease, lung, thyroid, and dementia/Alzheimer’s disease, and have become the leading causes of illness in the US. Most of us seem to understand where this increase in chronic disease is coming from. The aging population is growing as life expectancy rates increase. The rates of obesity for adults – and children – have more than doubled since the 1960s (2). Portion sizes are also increasing – one of my team members was recently telling me a story about her (35 year old) wedding china, and how she couldn’t really use them anymore, as the plates were too small for today’s typical meal! Now, with over 133 million Americans suffering from a chronic disease, getting evaluated and adequately treated really requires more than the typical 15 minute (acute care-centric) office visit to cover more medical history, and generally, more testing (which is often not covered by insurance). Unfortunately, the conventional standard of care model is based on inadequate testing and restrictive treatment. 1. The standard of care approach to Hashimoto’s is what I consider to be a lab number, T4-centric and reactive model, practiced by most conventional doctors and endocrinologists. If a patient presents with a series of known thyroid symptoms, the standard of care approach is focused on testing for low levels of TSH (thyroid-stimulating hormone). The issue with this for someone having Hashimoto’s is that TSH often tests as abnormal only after a lot of damage to the thyroid has already been done. There are 5 stages of disease progression in developing Hashimoto’s, and TSH doesn’t usually test as abnormal until stage 4! It is not a “preventative” test, and a person with Hashimoto’s may appear to have normal TSH levels and be told they are fine… for years. This happened to me. Even though I was suffering from many thyroid symptoms (debilitating fatigue, joint pain, low stomach acid, hair loss, and more), my TSH test was “normal.” My condition worsened over the next decade, until I learned that thyroid antibody testing was really the appropriate “preventative” testing that I should have done much earlier. Thyroid antibodies are typically seen much sooner than an abnormal TSH level, usually as early as stage 2, but this testing doesn’t fall under the “standard of care” that a physician would routinely order for thyroid symptoms. I also subsequently learned that the TSH ranges typically used by labs today are based on outdated reference ranges! 2. If thyroid levels are deemed “abnormal”, levothyroxine (T4) is the thyroid hormone of choice prescribed to most people with Hashimoto’s. This recommended “one-size-fits-all” treatment is also given to those who have had their thyroid removed, those who have a congenital defect on their thyroid gland, and those with nutrient-deficiency-induced thyroid conditions. 3. Thyroid medications are expected to address a patient’s symptoms, and patients are often told that they should begin feeling better in a few weeks. Once on this prescription-only path, a patient will likely have limited follow-up that is focused primarily on the medication’s effectiveness at improving the TSH level. (Note: this is not the same thing as addressing their autoimmune condition or focusing on improving how the patient feels!) TSH levels may improve, but the patient’s condition can worsen, as Hashimoto’s is progressive and their immune system will likely continue to attack the thyroid. Patients who continue to be symptomatic are often referred to other specialists for additional medications to target symptoms, such as dermatologists for hair loss, or psychiatrists for depression. These symptoms are not recognized as being related to the autoimmune thyroid condition or its root causes. 4. The conventional approach is about managing the “disease” rather than offering the support and tools needed to help them fully recover. There are usually no lifestyle recommendations or attempts to find triggers for the autoimmune response against the thyroid, and one’s thyroid antibodies are rarely even tracked. 5. The conventional approach limits its focus to the particular follow up appointment and labs, monitoring the medication’s effects at each visit, instead of having a practitioner truly partnering with the patient to figure out why their bucket is leaking in the first place (and what they can do about it). There is never a focus on making the autoimmune issue better! Instead, the condition is seen as “irreversible”, but patients are told that medication will at least supply the body with the hormone (which the thyroid is no longer able to produce on its own) that it needs. If this is the first time you are hearing about any proactive strategies (or any other strategy besides medication) that may help address your Hashimoto’s, you might feel overwhelmed, frustrated and even angry. But, I encourage you to feel empowered instead, as there is another approach－the Root Cause approach－which goes beyond what conventional medicine can offer. It has helped myself and many other people to feel better, and even put their Hashimoto’s into remission! While some of you may not have previously heard the specific terminology of “root cause” used, you may be familiar with the concept of functional medicine. Functional medicine tries to answer the question, “Why did this person develop a particular condition?” versus “What condition do they have?”. Functional medicine practitioners also want to know what an individual can do to prevent the progression of their condition, and even how to potentially reverse the condition. My Root Cause approach is built on functional medicine’s core principles and is patient-centered. While this approach takes a lot more time (certainly more than today’s 10-15 minute, acute care-centric visit) and requires a more rigorous review of medical histories, additional lab testing, and more ongoing support, it gets results. Many people who are diagnosed with hypothyroidism will never be tested for or told they have Hashimoto’s. They will never know – or won’t know until a lot of damage has been done – that they have an autoimmune condition that can continue to worsen even if they are given thyroid hormone replacement medication. We also utilize comprehensive thyroid tests and optimal/functional ranges of thyroid hormones, instead of outdated reference ranges, to determine diagnosis and the need for thyroid hormone therapy. We optimize thyroid hormones utilizing the T3 and T4 hormones, when necessary (only T4 is present in levothyroxine, the most commonly prescribed thyroid drug, but many people report feeling better with the addition of a T3-containing medication). As mentioned above, labs are still utilized in medication monitoring, but the person’s symptoms are a primary tool in determining treatment. The Root Cause approach also focuses on reversing the autoimmune attack on the thyroid. Let’s talk more about how autoimmune diseases can be reversed with the Root Cause approach — but first, it is important to understand how autoimmunity develops. The medical community used to believe that once an autoimmune process is activated, it no longer requires ongoing exposure to its particular environmental trigger, and becomes self-sustaining. In other words, Hashimoto’s would be irreversible no matter what you did about the initial trigger. But this has been shown to not be the case. Autoimmune issues can be reversed. The particular environmental trigger does in fact need to be continuous in order to perpetuate the autoimmune process. This means that an autoimmune condition, such as Hashimoto’s, can be stopped and reversed when the triggers are eliminated. One example of this is celiac disease, an autoimmune condition where gluten has been identified as an environmental trigger. In most cases of classical celiac disease, all symptoms resolve when gluten is removed from the diet. That’s how the Root Cause approach works. You identify the triggers and remove them to get better. All three requirements of this “three-legged stool” must be present, or a person will not develop an autoimmune disease. Based on this, by removing one of the factors of autoimmunity, we can reverse Hashimoto’s. To me, this is very empowering! While we can’t change our genes, we can definitely remove triggers (once we identify them through our root cause detective work) and heal our gut (by identifying the root causes of our leaky gut). In order to do so, we must first understand what makes up an autoimmune attack. If we understand the steps in the autoimmune cycle, we can interrupt the cycle and stop the breakdown of our thyroid tissue. Thyroid cells are damaged by triggers such as food sensitivities, infections, trauma or toxins. Damaged thyroid cells send out a stress signal. Immune cells rush to “save” the thyroid from invaders. Immune cells attack the thyroid instead, so additional thyroid cell damage occurs. The body cannot continue to regenerate thyroid cells. The thyroid is no longer able to produce adequate levels of thyroid hormone. As previously mentioned, the conventional model focuses on adding more thyroid hormone (typically just T4) in response to the lack of thyroid hormone being produced. But that doesn’t stop the leaky bucket. The immune system will continue to attack. However, if we can break the cycle of autoimmunity by removing the two legs of the “three-legged stool” that we can change, we can fix the leaky bucket. Then we will heal. So, let’s talk about the other two legs of the stool: intestinal permeability and triggers. Again, conventional medicine won’t typically look at these causes, nor at how addressing them can heal Hashimoto’s. While there is a very long list of potential triggers that can cause intestinal permeability, the most common triggers that cause leaky gut are food sensitivities, nutrient deficiencies, a deficiency in digestive enzymes, an imbalance of gut bacteria, and intestinal infections. When I was first putting on my own Root Cause detective cap, I had so many miserable symptoms that didn’t seem related to my thyroid issues, such as acid reflux, diarrhea, joint pain, and bloating. My thyroid hormone medication wasn’t helping with these symptoms, so I kept digging for their root cause. I read the research on gluten as a significant inflammatory food for celiacs (3); as well as research which found that gluten induces intestinal permeability in individuals whether or not they had celiac disease (4). I then tested positive for food sensitivities to gluten and dairy, so I decided to try going on both a gluten and dairy free diet. I was quite surprised when my acid reflux, irritable bowel syndrome, and stomach pains completely went away within three days! I had been taking all kinds of antacid medications, including Tums, Pepcid, and proton pump inhibitors. After removing gluten and dairy, I was able to stop taking all of my acid-suppressing medications. In my 2015 survey of 2,232 people with Hashimoto’s, 86 percent of respondents who had gone on a gluten free diet reported improvements across their digestive symptoms. For some people, getting off of gluten completely reversed their thyroid disease and even regenerated their thyroid tissue. You can read more about gluten’s effect on intestinal permeability here. Gluten is not the only dietary intervention that helps improve gut health and symptoms. In the same survey, 79 percent said a dairy free diet made them better. Dairy was a huge food sensitivity for me, but many other dietary interventions helped me as well. You can read more about specific food sensitivities and dietary interventions here. Functional medicine practitioners will tell you that “food is medicine” and that the foods you eat will determine whether you will be on a healthy path or not. They – and I as a root cause detective – believe that inflammatory foods can play a key role in developing chronic disease. Inflammatory foods affect our overall gut health. The gut has the all-important job of digesting and absorbing key nutrients that keep our body – including our thyroid – functioning properly. Addressing these food sensitivities, nutrient and digestive enzyme deficiencies, and intestinal infections, can help to address the leaky gut and reverse the condition. This knowledge is very exciting! Changing my diet, removing food sensitivities, and addressing nutrient deficiencies were important steps in my healing journey, but they were just the beginning. In my clinical practice, I have also often found infections to be a primary root cause for Hashimoto’s. When people don’t feel better with dietary changes, I have found that many of them – up to 80 percent of my clients – eventually test positive for one, or more, infections! There are a number of other possible environmental triggers, too. Dental procedures, periods of stress, medications you may take, surgeries, accidents, and environmental toxin exposures… all of these can be your unique causes for your autoimmune symptoms. Stress is another common trigger. In fact, in my 2015 survey of 2,232 readers with Hashimoto’s, 69 percent said they had experienced a period of serious stress prior to experiencing their symptoms! Remember, triggers are one of the legs of the three-legged stool for autoimmunity. So the good news is that if you remove them, you will feel better! But how do you identify all of your possible triggers? That’s where thoroughly reflecting on your health history comes in. This is different from the conventional first office visit medical history checklist. (Did you ever have these diseases? – yes/no). In my Root Cause approach, the client intake form is one of the most important tools I use to help people recall, What was happening in your life right before you started to feel unwell? Here is a sample health timeline for you to use in creating one for yourself. Think back as far as you can remember. Maybe you can recall that you started feeling unwell after a particular illness or dental procedure. Perhaps you went on oral contraceptives and started experiencing symptoms. Once you’ve completed your timeline, you can put on your detective’s hat and look into addressing them, following the protocols outlined in my book Hashimoto’s Protocol. So how can you get started with the Root Cause approach today? Don’t let yourself get overwhelmed. I know that reflecting on your medical history may seem daunting, but it’s a great place to start identifying your possible root causes. The good news? Tackle the root causes one by one and you’ll find that many (such as removing food sensitivities) are relatively easy to try and may have pretty immediate results. Addressing one root cause or symptom may even help with another. For example, you may supplement with magnesium to address a deficiency and improve constipation, then find that it also helps resolve your pain and anxiety! Or, you may treat an underlying H. pylori infection, and find that it also helps to resolve your SIBO. Get my recommended (and optimal!) thyroid testing, even if you have to order it yourself (in which case, go to step 3 and find a better practitioner!). Remember that the conventional standard of care lab test is TSH, which may not test as abnormal until stage 4 of Hashimoto’s, after a lot of thyroid damage has already been done. Antibodies testing will provide you with an early warning as to whether your thyroid is being attacked. Antibodies show in stage 2 of Hashimoto’s. For more information on thyroid antibody/hormone testing as well as optimal ranges to look for, check out this earlier blog. It also includes self-test options. Find the right doctor. If your doctor isn’t listening to you, isn’t ordering optimal hormone tests, isn’t treating all of your symptoms (but is sending you to multiple specialists for different symptoms), or isn’t looking for your root causes, it may be time to look for a practitioner who has been trained in the functional medicine (Root Cause) approach. I’ve started a list of practitioners that I believe are knowledgeable in the root cause approach. You can get the list here. Please don’t abandon your conventional medical therapy, prescriptions, or doctor without consulting with a new health care provider first and ensuring you have continued care and guidance. Most conventional doctors will view Hashimoto’s from a conventional approach, which aims to correct thyroid hormone levels (typically TSH), but does not address the root causes of the condition. 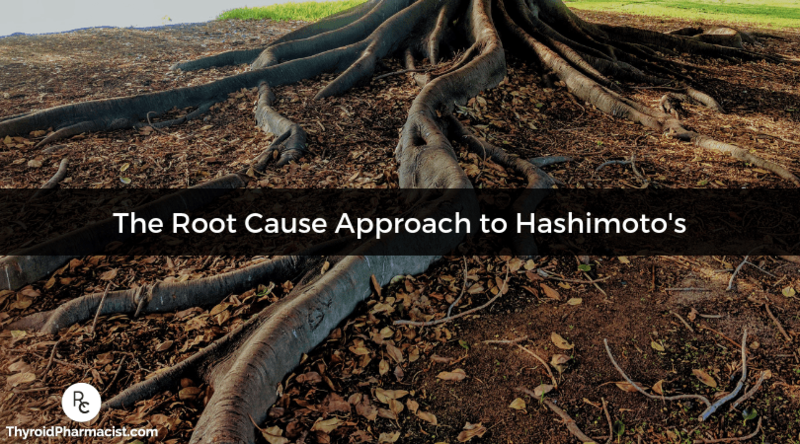 In contrast, the Root Cause approach to Hashimoto’s is a patient-centered, functional approach, which looks at the whole body to determine the underlying issues of autoimmunity, in order to reverse the condition. Remember, without having all three legs of the three-legged stool, you can stop the autoimmune attack on your thyroid and reverse the condition. While each of us will have our own combination of root causes, almost everyone with Hashimoto’s has food sensitivities, and most people experience huge benefits from dietary interventions. This is why I am so passionate about using food as medicine! My new healing guide, Hashimoto’s Food Pharmacology: Nutrition Protocols and Healing Recipes to Take Charge of Your Thyroid Health, is out now and takes this approach of using the power of food to discover your own root cause and heal your body — naturally! It is packed full of healing recipes and protocols specifically for people with Hashimoto’s or autoimmune conditions. While food and nutrition are very common triggers, know that in some cases you will still need to dig deeper for additional root causes. For a comprehensive overview of my approach, check out my books Hashimoto’s Protocol and Hashimoto’s: The Root Cause. I provide detailed information on all of the root causes that I routinely see in my clinical practice, and how you can figure out what your root causes are, including recommended lab testing and interventions that can help. Keep me posted on your progress and questions on Facebook! P.S. You can download a free Thyroid Diet Guide, 10 additional thyroid-friendly recipes, and the Nutrient Depletions and Digestion chapter of my first book for free by signing up for my newsletter. You will also receive occasional updates about new research, resources, giveaways and helpful information. Remington PL, Brownson RC. Fifty Years of Progress in Chronic Disease Epidemiology and Control. Supplements. 2011 Oct;60(04):70-77. Remington PL, Brownson RC. Fifty Years of Progress in Chronic Disease Epidemiology and Control. Supplements. 2011 Oct;60(04):70-77. https://www.cdc.gov/mmwr/preview/mmwrhtml/su6004a12.htm#fig5. Published October 7, 2011. Accessed December 20, 2018. Sategna-Guidetti C, Volta U, Ciacci C et al. Prevalence of thyroid disorders in untreated adult celiac disease patients and effect of gluten withdrawal: an Italian multicenter study. The American Journal of Gastroenterology. 2001;96(3):751-757. doi:10.1111/j.1572-0241.2001.03617.x. Hollon J, Puppa EL, Greenwald B, et al. Effect of Gliadin on Permeability of Intestinal Biopsy Explants from Celiac Disease Patients and Patients with Non-Celiac Gluten Sensitivity. Nutrients. 2015;7(3):1565–1576. doi:10.3390/nu7031565. What effect does Hashimoto’s have on eczema, atopic dermatitis? Thanks for everything you do for us Hashimoto’s people, Dr. Wentz. Sure wish I’d known all this when I was diagnosed in 2002. Alas, I’ve concluded it might be too late for me after over a decade on thyroid replacement. About three years ago, I read your book, got with my wonderful doctor, and tried some of your suggestions. Got food sensitivity testing, found a number of positives and cut them out for 18 months (gluten wasn’t one of them, but cut it out anyway). Dairy, corn, chicken, egg, gluten, soy–it was hard. Got stool tested too–looked quite good, except for lacking friendly bacteria. Did the heal-your-intestinal-permeability protocol (vast majority of it, anyway). Got thyroid ultrasound again (had only one done before, at diagnosis). Got other thyroid testing. Had destressed years ago, when I retired. Diet was very, very hard to stick to, friends couldn’t believe I was doing it. Exercised daily. SO: I never had many symptoms with Hashimoto’s, went for dx when I noticed slight swelling in neck. The only things I noticed from all this was 20-lb. weight loss that came right off and stayed off (I heard others say they had the same thing when they went off gluten), and my ankles stopped swelling. Other than that–no decrease in antibodies, which was disappointing…couldn’t do any more thrashing around trying to find root causes at the time…burned out after 18 months. Went off crazy diet, gained weight back. Well…better luck to everyone else, I hope you catch your Hashimoto’s sooner and reverse it! Ending on positive note, I just started gluten free again this month, and it sure is easier than cutting out just about everything. Already avoid soy like the poison it is. Donna – thank you so much for reaching out and sharing your journey with me. <3 Don't give up! It's not to late to feel better. Going gluten-free is always the first step that I recommend. Through my research, I've found that a good percentage feel better off gluten. About 20% will actually go into remission by doing so. Some researchers have found that three to six months on a gluten-free diet can eliminate organ-specific antibodies. IS GLUTEN THE ROOT CAUSE OF YOUR THYROID CONDITION? Corinn – thank you for reaching out. I understand how overwhelming this can be. <3 Hashimoto’s is often a combination of food sensitivities, nutrient deficiencies, adrenal issues, gut issues as well as an impaired ability to get rid of toxins. Any of those things would prevent a person from getting better. Hashimoto's is very much an individual condition. While there are root cause commonalities, each person will have their own or in some cases, more than one root cause. You will have to start with the simplest modifications, by removing triggers, followed by repairing the other broken systems to restore equilibrium, allowing the body to rebuild itself. You will need to dig down to why the immune system is imbalanced in the first place and this will tell you how you begin to finally feel better, reduce your thyroid antibodies and even take your condition into remission. You will have to create your own health timeline. Look back at your overall history as far back as you can remember. Look for infections, periods of severe stress, the use of medications (especially antibiotics, antacids, and oral contraceptives), accidents, and exposure to toxins. These are events that may have contributed to Hashimoto's. Once you do, you will know what types of changes you need to implement to make yourself feel better. If you need further support, please check out the list of lab tests inside the “Testing” chapter of my book, Hashimoto’s Root Cause. I also offer a 12-week program, Hashimoto's Self Management Program. Here are some resources I hope you find helpful as well. Your book says that dental procedures can lead to autoimmune problems. I have Hashimotos and am having my top two wisdom teeth removed. Both are decayed and one has an infection that occurs every couple of months. Since wisdom teeth extractions can cause cavitations, what should I do to prevent this from happening? I am removing the wisdom teeth to reduce the chronic infections but do not want the removal to cause problems. Spencer – thank you for reaching out. I am so sorry you are going through this. <3 Impacted and decayed teeth can create inflammation around the root of the other teeth and can lead to gingival inflammation, periodontitis, and tooth decay. I highly recommend a Biological dentist. Biological dentistry is a branch of dentistry that looks at the connection between oral care and the health status of the rest of the body. While most traditional dentists focus only on “rescue care” rather than prevention, biological dentists try to prevent health problems that may originate from exposure to certain procedures and materials. To find a biological dentist in your area, visit the International Academy of Oral Medicine & Toxicology’s website at http://www.iaomt.org for a listing. Have you seen these articles? Thank you for all the information and all you do in helping people with thyroid issues. I am a little confused. I have anti -TPOs elevated (and pain in my neck present for nearly 4 months now), which would mean stage 2 of Hashimotos. At the same time, I do not believe I have leaky guts as I have no symptoms/discomforts whatsoever. According to the findings of Dr Fasano I do not have all three factors present to develop an autoimmune disease. I’ve identify stress as my trigger. Could you, please, try to explain to me what, in your opinion, is happening to me? Have I got Hashimoto’s? Can I have leaky guts without being aware of it? Karolina – thank you so much for reaching out. We know that intestinal permeability (aka leaky gut) is present in every case of autoimmunity and often precedes the development of Hashimoto’s. Symptoms of leaky gut may include bloating, diarrhea, constipation, stomach aches, acid reflux and irritable bowel syndrome. According to the Institute of Functional Medicine, many people develop IBS 5-10 years before an autoimmune diagnosis. I was one of them and didn’t take my gut health as seriously as I should have. Gut problems are often caused by infections like H. pylori, parasites like Blasto, SIBO, an imbalance of bacteria, and enzyme deficiencies or food sensitivities (especially to gluten, dairy, and/or soy). Even stress can be a factor in gut permeability. Here are some articles you might find interesting.